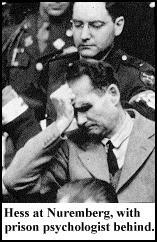 In brief: Rudolf Hess (1894-1987), Deputy Führer and considered to be the number 3 man in Hitler's Germany after Göring. Hess was a somewhat neurotic member of Hitler's inner circle best known for his surprise flight to Scotland on May 10, 1941 in which he intended to negotiate peace with the British, but which resulted in his capture and long term imprisonment. Rudolf Hess was born in Alexandria, Egypt, April 26, 1894, the son of a prosperous wholesaler and exporter. He did not live in Germany until he was fourteen. He volunteered for the German Army in 1914 at the outbreak of World War One, partly to escape the control of his domineering father who had refused to let him go to a university but instead persuaded him into an unwanted career in the family business. In World War One, Hess was wounded twice, then later became an airplane pilot. After the war, Hess joined the Freikorps, a right-wing organization of ex-soldiers for hire, involved in violently putting down Communist uprisings in Germany. At the University of Munich, Hess studied political science and came under the influence of the Thule Society, a secret anti-Semitic political organization devoted to Nordic supremacy. 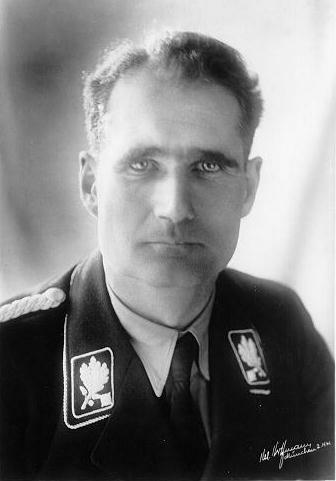 Hess was also influenced by Professor Karl Haushofer, a former general whose theories on expansionism and race formed the basis of the concept of Lebensraum (increased living space for Germans at the expense of other nations). After hearing Adolf Hitler speak in a small Munich beer hall, Hess joined the Nazi Party, July 1, 1920, becoming the sixteenth member. After his first meeting with Hitler, Hess said he felt "as though overcome by a vision." At early Nazi Party meetings and rallies, Hess was a formidable fighter who brawled with para-military Marxists and others who often violently attempted to disrupt Hitler's speeches. In 1923, Hess took part in Hitler's failed Beer Hall Putsch in which Hitler and the Nazis attempted to seize control of Germany. Hess was arrested and imprisoned along with Hitler at Landsberg prison. While in prison, Hess took dictation for Hitler's book, Mein Kampf, and also made some editorial suggestions regarding Lebensraum, the historical role of the British Empire, and the organization of the Nazi Party. After his release from prison in 1925, Hess served for several years as Hitler's personal secretary in spite of having no official rank in the Nazi Party. In 1932, Hitler appointed him Chairman of the Central Political Commission of the Nazi Party and SS General as a reward for his loyal service. On April 21, 1933, he was made Deputy Führer, a figurehead position with mostly ceremonial duties. Hess was a shy, insecure man who displayed near religious devotion, fanatical loyalty and absolute blind obedience to Hitler. In 1934, Hess gave a revealing speech stating - "With pride we see that one man remains beyond all criticism, that is the Führer. This is because everyone feels and knows: he is always right, and he will always be right. The National Socialism of all of us is anchored in uncritical loyalty, in the surrender to the Führer that does not ask for the why in individual cases, in the silent execution of his orders. We believe that the Führer is obeying a higher call to fashion German history. There can be no criticism of this belief." One of his most visible tasks was to announce the Führer at mass meetings with bellowing, wide eyed fanaticism, as seen in the Nazi documentary, Triumph Of The Will. Although often rewarded by Hitler for his dogged loyalty, Hess was never given any major influence in matters of state due to his lack of understanding of the mechanics of power and his inability to take any action on his own initiative. He was totally and deliberately subservient to his Führer. He was granted titles such as Reich Minister without Portfolio, member of the Secret Cabinet Council, and member of the Ministerial Council for Reich Defense. In 1939 Hess was even designated to be Hitler's successor after Göring. But over time, his limited power was further undermined by the political intrigue of the top Nazis around Hitler who were constantly scheming for personal power. Hess had only one desire, to serve the Führer, and thus lacked the will to engage in self serving struggles for power and lost out primarily to his subordinate and eventual successor, Martin Bormann. As a result, Hitler gradually distanced himself from Hess. Hoping to regain importance and redeem himself in the eyes of his Führer, Hess put on a Luftwaffe uniform and flew a German fighter plane alone toward Scotland on a 'peace' mission, May 10, 1941, just before the Nazi invasion of the Soviet Union. Hess intended to see the Duke of Hamilton, who he had met briefly during the Berlin Olympics in 1936. With extra fuel tanks installed on the Messerschmitt ME-110, Hess, an expert flier, made the five hour, 900 mile flight across the North Sea and managed to navigate within 30 miles of the Duke's residence near Glasgow, Scotland. At 6,000 feet Hess bailed out and parachuted safely to the ground then encountered a Scottish farmer and told him in English, "I have an important message for the Duke of Hamilton." Hess wanted to convince the British Government that Hitler only wanted Lebensraum for the German people and had no wish to destroy a fellow 'Nordic' nation. He also knew of Hitler's plans to attack the Soviet Union and wanted to prevent Germany from getting involved in a two-front war, fighting the Soviets to the east of Germany, and Britain and its allies in the west. During interrogation in a British Army barracks, he proposed that if the British would allow Nazi Germany to dominate Europe, then the British Empire would not be further molested by Hitler. He insisted that German victory was inevitable and even threatened that the British people would be starved to death by a Nazi blockade around the British Isles unless they accepted his generous peace offer. But Hess also displayed signs of mental instability to his British captors and they concluded he was half mad and represented only himself. Churchill, realizing this, and somewhat infuriated by his statements, ordered Hess to be imprisoned for the duration and treated like any high ranking POW. Hess was declared insane by a bewildered Hitler, and effectively disowned by the Nazis. His flight ultimately caused Hitler and the Nazis huge embarrassment as they struggled to explain his actions. During his years of British imprisonment, Hess displayed increasingly unstable behavior and developed a paranoid obsession that his food was being poisoned. In 1945, Hess was returned to Germany to stand trial before the International Military Tribunal at Nuremberg. In the courtroom, he suffered from spells of disorientation, staring off vacantly into space and for a time claimed to have amnesia. In periods of lucidity he continued to display loyalty to Hitler, ending with his final speech - "It was granted me for many years to live and work under the greatest son whom my nation has brought forth in the thousand years of its history. Even if I could I would not expunge this period from my existence. I regret nothing. If I were standing once more at the beginning I should act once again as I did then, even if I knew that at the end I should be burnt at the stake�"
In spite of his mental condition, he was sentenced to life in prison. The Soviets blocked all attempts at early release. He committed suicide in 1987 at age 92, the last of the prisoners tried at Nuremberg.